Ask A Travel Agent: River Cruise Expert Karen | UNIGLOBE Direct Travel Ltd.
Our river cruise expert, Karen, answers all your questions. What is the difference between river cruising and ocean cruising? River cruises are more intimate, and typically more inclusive, than ocean cruising. The included shore excursions are offered in smaller groups, and walking tours may be offered at different paces, such as leisurely, moderate or fast paced to accommodate your personal style. Some cruises have bikes available to explore along the rivers as well. 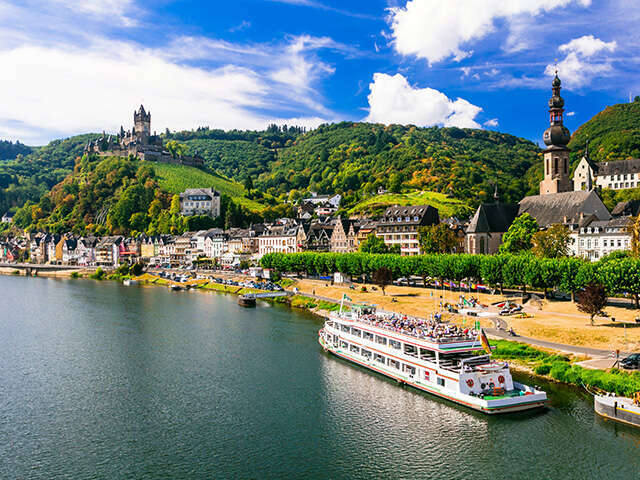 River cruises really take you right into the heart of the villages and iconic cities along Europe’s famous rivers, Asian or Russian waterways. Walking into the historic towns and villages from where the river ships are docked is usually quick and easy. There is not as much choice for evening entertainment on a river cruise but the local artists that the cruise line brings on board are varied and entertaining. Who would you recommend river cruising for? I think anyone who is interested in a slower paced holiday that really focuses on culture and local food & wine will really enjoy a river cruise. Also, as they are more inclusive there really is not much extra to pay for - so almost all of your vacation costs are paid up front. How far in advance should you book a river cruise? I encourage my clients to book as far as a year ahead for a river cruise. Some cruise lines fill up quickly and to get your preferred cabin choice it’s best to book early. Cruise lines offering air deals are also becoming more common, these are good options to explore well ahead of time. What are some popular destinations for river cruising? I think the most popular itinerary that I book is Amsterdam to Budapest. The Douro River in Portugal and some itineraries in France are also popular. River cruising has expanded greatly. A number of cruise companies have expanded their land packages around the cruises itineraries to offer an impressive choice of product. For example, a river cruise combined with land tours has become a popular way to visit Vietnam and Cambodia with time in Hanoi, Ho Chi Minh City, Siem Reap and even an overnight in Halong Bay. What is your favourite river cruise that you have been on? I really enjoyed the cruise I took on the Danube. The evening cruise showcasing the iconic Budapest lights was really lovely. Melk Abbey and cruising the Wachau Valley was also a highlight. What is the advantage of booking a river cruise through a UNIGLOBE travel agent? When clients want to book a river cruise sometimes they want a specific company but often they are new to river cruising and want options. They want to know the cruise styles of the various companies. From ship size, to client budget-- we wade through the various promotions to come up with the options that will suit them best. Another benefit is that we can put the cruise together with flights, extra hotel nights, land tours and insurance to make it a seamless vacation.